Mahalebi is a cream we make in Cyprus like pudding. The traditional way of flavouring this cream is with rose water, rose syrup and orange blossom water. Back at home my mom served it with spoon sweets and a little syrup on top and my favourite would be with bitter orange spoon sweet. For a sweeter mahalebi, instead of adding sugar in the cream, you can add a little bit more corn starch and add some of the spoon sweet syrup to sweeten and flavour it. Now that I am cutting on the calories, whenever I make this cream I make it with low fat milk and fructose and serve it with fresh fruit which I cook a few minutes with some fructose. 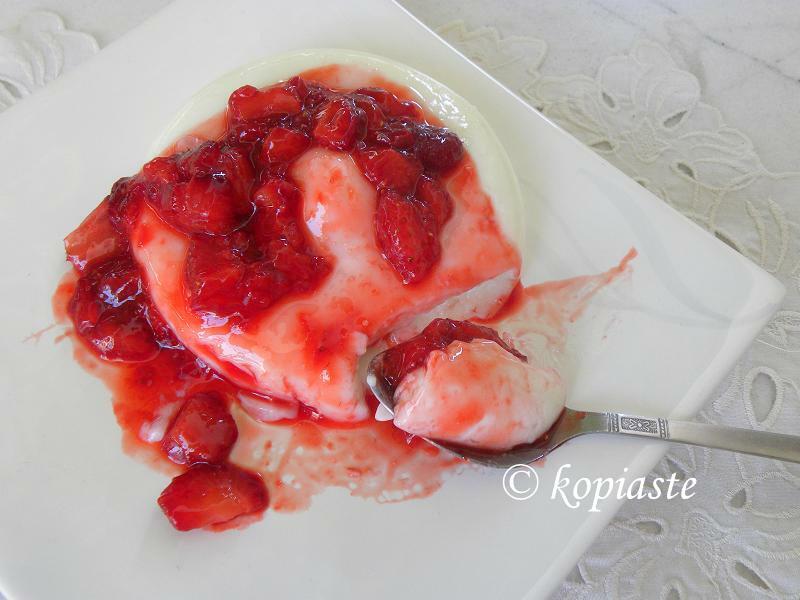 I made this pudding at the beginning of May but there are still fresh strawberries in the market and the sauce is very easy to make. I just added a little fructose on the strawberries and mixed it for five minutes in a frying pan. Instead of serving the sauce on top as I did, if you like you can mix it in the cream and make the cream pink and flavoured with strawberries. I put aside two for my husband and I and as the children like the cream to be sweeter, in the remaining cream I added a few pieces of white chocolate, which I mixed in while the cream was still hot so that it would melt and then crumbled some chocolate chip cookies in the cream. Finally, I added some chocolate shavings on top. This recipe goes to Tobias, of Tobias cooks, for his 8th Mediterranean Cooking Event, featuring Cyprus. Ciao Ivy !! Definitely this is a wonderful treat ! I'm sure carlo and anita (and everybody) are going to love them !! You know what would be my best treat ? To spend a whole day with you in the kitchen !!! Love to you all ! A light and luscious treat! I love that dessert! What a lovely, easy dessert Ivy. As I particularly love the taste of rose water this sounds delightful! Wow the dessert looks so so soft , than i canimaging the feeling it sliding down on ones throat while eating it. Wish i had one of them right now. Your pudding looks fantastic! I love the strawberries in it, and the version with added white chocolate sounds great too. So creamy and decadent! Love it! Wat a cute,elegant and beautiful dessert..
What a sweet treat these are Ivy! The white chocolate has me smitten. What a lovely recipe and beautiful dessert, Ivy. You know, that name sounds like mahleb, a Middle Eastern spice mixture, that my mom uses in her Easter sweet breads. Do you know if it's related? Susan, I don't think it is connected to mahleb. Mahalebi is a dessert made in many Middle Eastern countries and I think it means "creamy" or "pudding". I adore milk puddings. Ivy, the things you do with sweets just make me weak in the knees! I'm also trying to lose weight (and not doing a very good job of it), so a sweet treat like this which is low in fat AND sugar is right up my alley. Thanks for another drool-worthy post! I have never used fructose although I was always intrigued by it; I wonder if it is like what is called light corn syrup here in the US; anyway, great dessert, same name as ours too, and we also make it with a little preserve on top, like the bitter orange rind one. Fructose looks like sugar, only it's the sugar taken from fruit. It has a lower glycemic index and is twice as sweet as sugar. However, it should be consumed in moderation. Mmmm…looks delicious…creamy and yet light. Thanks for sharing. Nice idea to replace the sugar. I have started using date sugar instead of white sugar. it works for baking but does not desolve for coffee .. I love how you add fruit compote Ivy! Love your mahalebi recipe! Definitely I'm going to try it 🙂 Your photos look fantastic too! Thank you Myrto. Hope to be seeing you often from now on. My photos do not compare with yours. I just have a point and shoot camera , so I just take simple pictures. Those all look so cool and creamy and good! Please sent me your postal address, so I can send you the book! Great news. Thank you Tobias.